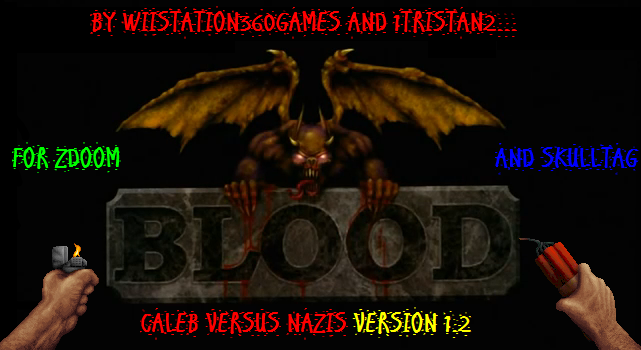 If you enjoyed Caleb Versus Nazis 1.1, or you're a Bloodite after some more, you'll be pleased to know that version 1.2 is on its way. This is the ultimate WAD compared to 1.1; it has patches for the minor glitches here and there; more speaking and one-liners; interesting new enemies like Cerberus and the dark green abomination known as the Nightmare Spectre; difficulty balancing for a more challenging experience, and FIVE full chapters of horror and fun! Combining all the DeathMatch maps (also playable solo or co-op) and Campaign maps as well (along with the new Credits map, taking a SIXTH chapter slot), that's 51 great maps! Excellent quality, combined with a few ports from ZBlood with permission for nostalgia. Stay tuned! And if you want to review version 1.1, that'd be interesting to see. Even some playthrough clips on YouTube might be interesting as well - but remember, it certainly isn't the end for Caleb and the Cabal - he's got some more evil to wipe out!